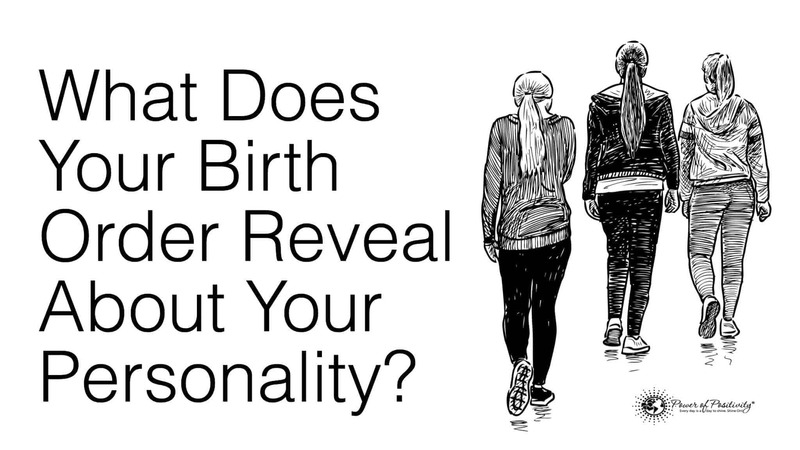 What Does Your Birth Order Reveal About Your Personality? Your siblings and you were always fighting over who was the favorite, but you might all be surprised to learn how your birth order affects your personality. Even only children have different perspectives on the world than the rest of us. Firstborn, middle child, or the youngest, the order that you arrived into your family can make a difference on how you feel about your role in the larger family of our society. How you spent the early years of your childhood make a difference in how you developed into yourself. In this article we will look at how birth order, from only child to the last born child, affects your personality. Researchers at the University of Michigan who studied intellectual development and birth order found that IQ was higher for the first born children typically. There was less difference in IQ between triplets and twins as you might imagine. Researchers also showed that the gap in IQ from first born to second decreased with the amount of time between children. For example, children spaced two years apart had less difference in IQ than those born one year apart. The scientists explain the intelligence differences this way; imagine your parents giving one child all of their attention and creating a stimulating environment for them to learn and grow. By the time the second child comes, even if the parents try to keep everything the same, their amount of attention they can give each child is reduced. Only children get the best of what their parents can give them because they don’t have to share attention with others. Only children may be thought of as being lonely, but they are very independently minded and are self-sufficient. Researchers who studied 800,000 participants found that verbal skills were higher for children in smaller family sizes and for first-born children. As the one and only, first-born children get all the help with early language skills that they could possibly need. An only child might feel some pressure because they have the sole responsibility for carrying on the family genes. As an only child, your personality tends to be spoiled. You’re used to getting what you want, but you are more than capable of either getting it for yourself or pouting to someone until you get it. As the eldest child, you had the responsibility of looking out for your younger brothers or sisters, but that doesn’t mean that you didn’t also torture your siblings every chance you got. As the oldest, you were taller and stronger, after all. You took the toys you wanted and the food you wanted from the others. There is evidence that firstborn children grow up to make more money and we have already said that hey have a higher IQ and verbal skills than their younger siblings. Again, this is about your parents giving you everything until child #2 came along. You may have some unresolved issues toward your siblings because you may see them as having stolen some of your limelight from Mom and Dad. It’s OK because your siblings might still resent you for getting the best of everything. As the go between for your older and younger siblings, you had to play the role of the negotiator. You are really good at keeping the peace and arguing to get what you want. You didn’t get as much attention as the eldest or youngest. You are comfortable speaking up for yourself because you had to. You also are better at being left to take care of yourself and are more independent that your siblings. Yes, you know how to share. In fact, you might think you’d be tired of it, but middle children seem to enjoy the community of family and a large group of friends around them. Middle children have excellent social skills, can typically manage emotions well, and pick up on subtle signals from people easily. You poor thing; you had to wear all of the hand-me-down clothes and play with all of the hand-me-down toys from your brothers or sisters. You got picked on, pushed around, and were always accused of ‘tattling’ on your siblings. You cried tears over toys taken away from you and what seemed like unfair treatment. But all those tears made it possible for you to appreciate when you did have a new toy or something to call your own. You are very charismatic and outgoing, partly because you had to speak up to be heard over your siblings. Mom and Dad were more confident parents by the time they had you. As a result, you might feel that they did not care about your childhood milestones like they did for your older brothers and sisters.